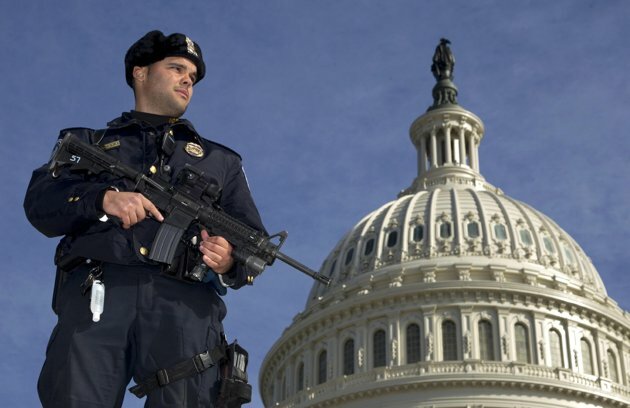 Capitol Police officer Angel Morales, stands on guard on the West side of the Capitol in Washington. Muslim groups and civil rights activists across the nation are calling for greater transparency in an Obama administration program aimed at countering homegrown terrorism. The organizers are speaking out Thursday through coordinated efforts in Boston, Los Angeles and Minneapolis, the three cities where the so-called “Countering Violent Extremism” program is being piloted. Representatives of the groups, which include local chapters of the American Civil Liberties Union and the Council on American-Islamic Relations, will be speaking at Karmel Square in Minneapolis, in front of Boston City Hall and at the Los Angeles office of CAIR just before noon on Thursday. Among their primary concerns is that federal agencies continue to host invitation-only discussions about the program, referred to as CVE, to the exclusion of dissenting groups. And despite months of planning, opponents say CVE organizers still refuse to share basic information about how these programs will actually work. In February, CVE organizers in the three cities released “framework” documents broadly sketching out their local objectives. The goal of the program is to have law enforcement and community leaders work together to prevent radicalization from taking root among young people and others vulnerable to extremist propaganda like that spread online by the Islamic State group. Boston, Los Angeles and Minneapolis have proposed a range of strategies to tackle the scourge, from town hall-style discussions for the Muslim community and educational and training sessions for school staff and social workers to mentorships and social media campaigns geared toward youth. The cities were chosen because law enforcement officials there have been doing outreach for years to Muslim communities. Thursday’s protests come as Congress is considering a proposal by Michael McCaul, chair of the House Committee on Homeland Security, to create a dedicated CVE office in the Department of Homeland Security to coordinate all local efforts. They also come as law enforcement officials in Boston recently touted their success in thwarting what they have described as two credible terrorist threats this summer. The first was the June shooting of 26-year-old Usaamah Rahim and the arrest of two other alleged accomplices in a planned attack on police. The second was the July arrest of 23-year-old Alexander Ciccolo, the son of a Boston police captain. Officials say Ciccolo was plotting to detonate a homemade bomb similar to the ones used in the 2013 Boston Marathon attacks on a college campus in support of the Islamic State group.